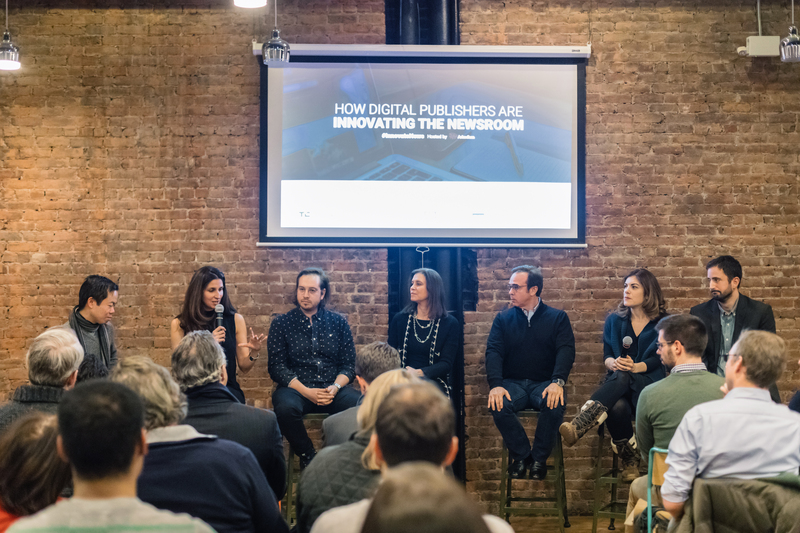 Experimentation and adaptability are the keys to charting a new path for digital publishers, said experts from Vice News, the New York Times, Quartz and other innovative newsrooms at a discussion last week in New York City. Take metrics, for example: A decade ago newsrooms were trying to get as much traffic as possible, but publishers now know big numbers don’t necessarily equate to big engagement. McCarthy said he thinks ad models will eventually value repeat visitors. Arkadium — which creates interactive content for publishers, with the goal of increasing brand loyalty and engagement — hosted the event. CEO Jessica Rovello asked the panelists whether they feel they have to trade traffic for brand. McCarthy said that’s an issue all journalists have dealt with, including those responsible for laying out a newspaper during pre-internet days. The difference now is that real-time information about what stories audiences are reading is available. Gertler said that while traffic is important, publishers shouldn’t fail to do important enterprise stories, despite the fact that they are expensive and take longer and often don’t pull in the same traffic. “We need to do those stories, we have an obligation to do those stories, and so the hope is that in the overall balance of our web traffic, we have other stories that are generating larger numbers to balance off the mission and role that we have as an institution in New York City,” he said. McCarthy said publishers should come up with realistic and relative baselines for what kind of traffic to expect for a story. “An article on trade policy should not have the same size audience as an article about Rihanna,” he said. The managing editor of Quartz, Heather Landy, said her publication aims to find the intersection between the interesting and the important. Eric Gertler, the Co-Chairman of both the New York Daily News and U.S. News & World Report said the internet allows the Daily News to reach younger audiences. Photo by Arkadium/Stephanie Massaro. Eric Gertler, who is the co-chairman of both the New York Daily News and U.S. News & World Report, said while Daily News readers have historically been members of the working class and identified with the Democratic party, audiences are moving toward the right politically, he said. And the newspaper’s website is also now reaching millennials, a young demographic that paper hasn’t had before. The issue of a divided America is a daily topic of discussion at USA Today, said Joanne Lipman, the chief content officer of Gannett and the editor-in-chief of USA Today. Of the company’s 110 properties, half are in blue states and half are in red. “In the run-up to the election, one of the things that we did was mobilize our properties across the country, but especially in red states, because we really wanted to understand that movement,” she said. USA Today was able to collect on-the-ground reporting from its different properties, including the Detroit Free Press, the Arizona Republic and the Des Moines Register, and then distribute it across its network, she said. The New York Times’ platform for publishing virtual reality stories, NYTVR, started as an experiment at the end of 2015, Graham Roberts, a senior editor at the Times, said. The Times mailed more than 1 million Google Cardboard viewers to readers. Because readers responded so strongly, the Times continued to publish new virtual reality projects. The New York Times also launched The Daily 360, where it publishes a 360-degree video every day. The videos tend to be about a minute long in length. Gannett’s first foray into virtual reality actually started at the Des Moines Register when the paper published a major interactive project, Harvest of Change, that tells the stories of family farmers impacted by economic and demographic changes in the United States. “Out beyond New York and beyond Washington, and between New York and L.A., there is this whole world of creativity that is so amazing,” she said. Lipman said there’s a large international audience for virtual reality. “We’re all in there because the technologies are changing so quickly, that you want to be there so that when the next thing comes, you’re ready to take that next step,” she said. Gannett will also be sending journalists from 10 of its properties to a drone journalism training program, she said. “The stuff that’s going on with virtual reality, it’s terrific, but at the end of the day, you’ve got to get your basic storytelling done right, because at the core, that’s where most of your traffic is coming from and that’s where you’re building your audience,” he said. Jessica Rovello founded Arkadium, which produces interactive content for digital publishers. Photo by Arkadium/Stephanie Massaro. Last fall Quartz launched a Bot Studio with a grant from the Knight Foundation. The publication made headlines when it released its app, which has an SMS text-like interface that users can chat with to get the news. The bot sounds human, which is because its scripts are written by humans, Landy said. She said Quarts is evaluating what its next steps will be. One idea is a newsroom bot created to assist journalists in their workflow.